It’s been a while since I posted a recipe, and I’m easing back into the swing of things with something super simple: a smoothie. 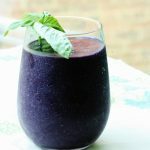 My post-bacc friends used to tease me that they could tell I had an exam looming if I started posting more smoothie recipes than usual, but I promise that this one isn’t a throwaway. I made it just before I left for New Orleans in Feburary, and it’s definitely one of the best smoothies I’ve made in a while: rich, sweet, creamy, energizing, and — for those readers who request banana-free smoothies from me — it’s actually fruit free altogether. For more about matcha and why I love it, you can check out this post (which features my matcha chia pudding). To sum it up, matcha is a grassy, sweet form of finely milled green tea powder. You can add it to lattes, smoothies, or even baked goods, and a very small amount goes a long way (about a half teaspoon is usually fine). 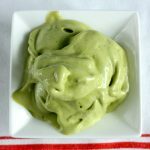 I’ve made matcha smoothies with banana before, but to mix things up, I wondered how matcha would mix with avocado and a bit of vanilla protein powder. Very well, as it turns out. Blend all ingredients till smooth. To this very simple, basic recipe, you could add any kind of fruit you like, as well as any mix-ins (flax seed, chia, whatever). I enjoyed the simplicity, but feel free to get creative. And if you’d like things a little sweeter (depending on the protein you use), feel free to add some dates or a touch of maple syrup. 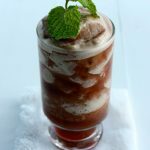 Any kind of vegan vanilla protein should work here, but I’d recommend rice or pea in this recipe, rather than hemp (which is often my go-to). Some favorite brands include Jarrow Brown Rice Protein, Sun Warrior vanilla, Vega Protein Smoothie in Viva Vanilla, and 22 Days Protein Powder in Vanilla. Hope you enjoy this easy recipe. I’ll be back tomorrow with my first California recap! You do! Can you get it online? Perfect timing! I received some matcha yesterday and was contemplating what to do with it. Ok that is the most beautiful hue I have ever seen. Gena, I miss seeing pictures of your cute little apartment! Is that weird? Ha! I think it’s super sweet, not weird! Do you mean my DC apartment, or the NYC one? Have you ever tried Perfect Fit Brown Rice Protein Powder? What do you think of it? Also, on a totally different topic, what are your favorite places to eat out in the Washington, D.C. area? Any places that offer cool vegan options (other than Sweet Green and Le Pain–obvious faves!!)? I really liked the nutrition profile, MPK, but I have to admit that I didn’t love the taste. A little too much stevia for me. But it’s good stuff. LPQ and SG are indeed the faves! But I also love Teaism (all locations). Great Sage in Clarksville is fabulous, if you can get there. Elizabeth’s Gone Raw is nice for a really fancy meal, but it’s an investment, and it’s only open for dinner Fridays. Also good for a special occasion: Blue Duck Tavern, Restaurant Nora, Cedar, Rasika, Room 11, and Iron Gate all have vegan menus upon request, as does the Columbia Room. Restaurants with vegan options: Meridien Pint, Tryst, The Coupe, Open City, Founding Farmers, Tonic, Beau Thai, Doi Moi, Todd Gray’s Muse (at the Corcoran), Agora, Commissary, Science Club, and Neyla. Thank you so much for replying!! This is so helpful and fun! I love seeing that you and Anne go on fitness/eating out dates in DC. (I love her blog, too.) I am from the area and I am moving back next fall. I plan to do that with my girlfriends, too! Yum! This looks so great 🙂 I bet it would also taste awesome with just a touch of carob powder too! Yeah, carob and matcha are AMAZING together. I used to make a coconut whip with matcha, and then have it on a base of carob macaroons. So.dang.good. I love the DO Matcha, but I recently got a sample of Kiss Me Organics, and it’s really good too. It’s rare that I make a fruit free smoothie, but that’s a cool tip re: chia. Thank you! Delicious! I love your matcha chia pudding and have been loving avocado in smoothies lately. I’ve been curious to hear how your travels went! To be honest, I find all rice protein a little chalky. No way around it, I guess. But I do like the 22 days stuff a lot — more than Sun Warrior. I just caught up a bit on the past couple of posts and this one. First off, I have some matcha powder I bought and has been unopened, so this is great. Finally have a use for it. I love matcha. Secondly, the weekend readings were really great this week. So informative and touching too! Thanks as usual! So glad you liked them, lady! Yummm 🙂 Can’t wait to hear about your Cali trip! Hope you have a wonderful weekend, Gena. 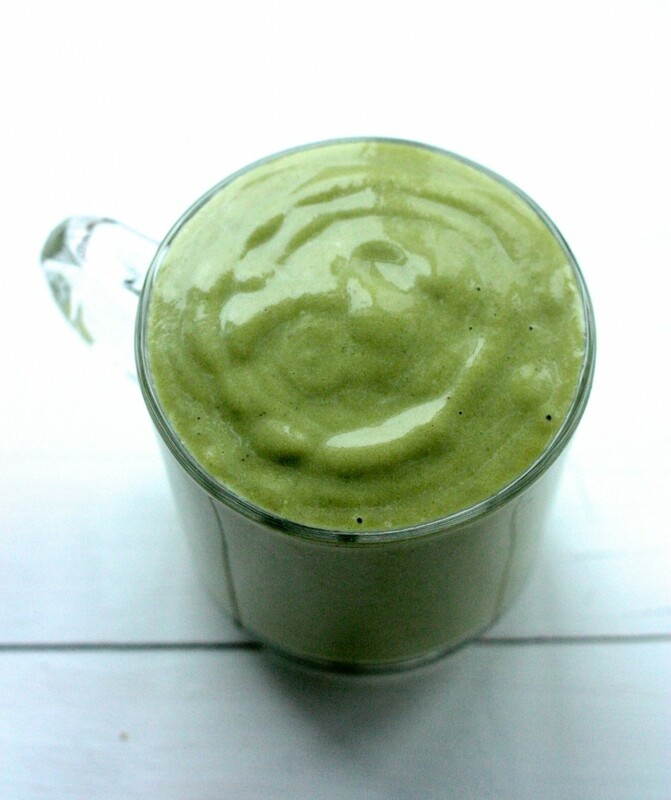 Love avocado in smoothies, so rich and creamy. This looks great. Ah, sacrilege! I love a frozen banana in my smoothies. They sorta make the smoothie for me. I have a question about maca powder. I just bought some, having never used it & wondering if you have any tips, recommendations? Do you use it? Daily? Maybe you’ve already done a post on it already…? AGREE. Banana-less smoothie = sadface. I’m so thrilled I found this blog. My journey eating vegan just started and I live in DC. I’ve been on vacation in Florida and the options while eating out are dismal in my hometown so it was a relief to read your list of DC restaurants with vegan menus. Phew! LOVE smoothie recipes! It’s so easy to get stuck in a “rut” with them and, as I hate to waste good organic produce, it often holds me back from experimenting too much. I can’t wait to try this. Thanks for all the protein powder recommendations and replies to everyone, too! I’ve had trouble finding one I like (tried a raw one by Eden and didn’t love it)- I’ll definitely looks for the Vega one now, would you say that’s the mildest in flavor of the ones you mentioned! Thanks! No problem! I hope you like it, Shayna. This looks sooo refreshing. And yummy. I will have to try this week. 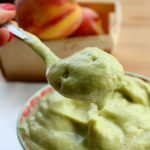 I try to have an avocado a few times a week – this will help! 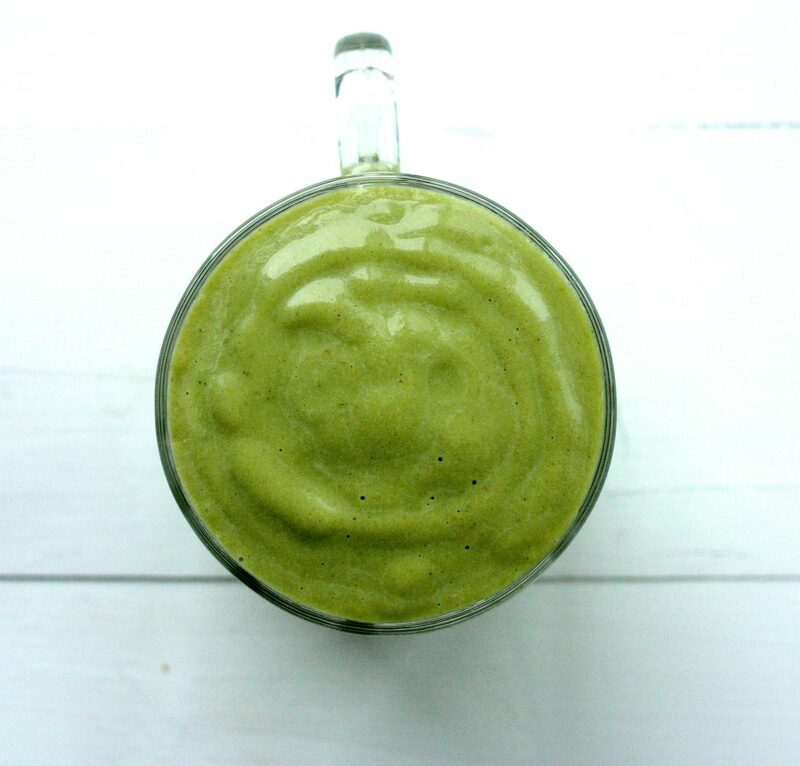 Great post!I love Smoothie an it’s gluten free is good for health. Yesterday i tried this but i added dry grapes and nuts for taste. My friend.. THIS IS THE BEST SMOOTHIE I’VE EVER HAD. So good. Making this tomorrow for breakfast! But one correction: the avocado is a fruit! I have never heard of matcha powder. However, I will be doing some research to check out the benefits. Thanks for the post! 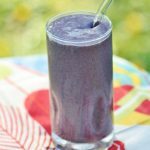 Do all of the proteins that you listed give this smoothie any sweetness? I added one pack of raw organic vanilla rice protein by NutriBiotic, but it did nothing to enhance the flavor so all I could taste was the avocado. I did try viva one vanilla too which worked better. Curious as to which other proteins will definitely give it some sweetness, though.